With its clear skies and low humidity, the southwestern United States is an astronomer’s paradise where observatories like Kitt Peak have redefined the art of skywatching. The region is unique in its loose federation of like-minded research outposts and in the quantity and diversity of its observatories—places captured in this unique guidebook. 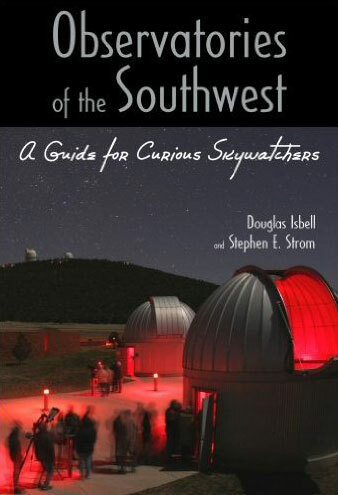 Douglas Isbell and Stephen Strom, both intimately involved in southwestern astronomy, have written a practical guide to the major observatories of the region for those eager to learn what modern telescopes are doing, to understand the role each of these often quirky places has played in advancing our understanding of the cosmos, and hopefully to visit and see the tools of the astronomer up close. For each observatory, the authors describe its history, highlights of its contributions to astronomy—with an emphasis on recent results—and information for visitors. Also included are wide-ranging interviews with astronomers closely associated with each site. Observatories covered range from McDonald in Texas to Palomar in California, with significant outposts in between: Arizona’s Kitt Peak National Observatory southwest of Tucson, the Lowell Observatory in Flagstaff, and the Whipple Observatory outside Amado; and New Mexico’s Very Large Array near Socorro and Sacramento Peak close to Sunspot. In addition to describing these established institutions, they also take a look ahead to the most powerful ground-based telescope in the world just beginning to operate at full power on Mount Graham in Safford, Arizona. With more than three dozen illustrations, the book is accessible to amateur astronomers, tourists, students, and teachers—anyone fascinated with the contributions that astronomy has made to deepening our understanding of humanity’s place in the universe, whether exploring the solar system from Lowell Observatory or studying the birth of stars using the army of giant radio telescopes at the Very Large Array. This book aims to inspire visits to these sites by illuminating the major scientific questions being pursued every clear night beneath the dark skies of the Southwest and the amazing machinery that makes these pursuits possible.